Who can resist the odd chocolate bar or roast potato from time to time? Most people have a weakness for high calorie foods of one kind or another - and what a dreary world it would be if we could never indulge ourselves. The important thing is not to let these temptations become daily battles. Try to eat sensibly throughout the day. Feeling full and satisfied is the best way to stave off cravings and food temptation. Drinking water helps too. When the will to resist is just not strong enough, however, there’s no point denying yourself and feeling deprived. There are often low calorie choices which may still be able to fool your taste buds, and satisfy your craving. Chocolate - Top of the Cravings Chart? Chocolate is probably the greatest weakness for most people. A high calorie food, both in fat and carbohydrates, it can put a serious dent in healthy eating plans. reduced fat chocolate wafer biscuits have only 99 calories each - good to remember the next time you reach for a packet of those chocolate covered raisins which can weigh in at 540 calories. 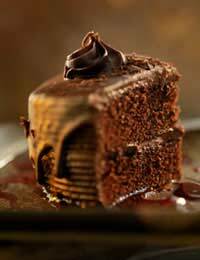 Perhaps all you need to satisfy a late evening craving for high calorie food is a cup of delicious cocoa. A generous teaspoon of cocoa is fewer than 10 calories. Mix it with a little boiling water and top up with semi-skimmed or skimmed milk for a low calorie treat. Just passing by a chip shop is enough to weaken some people’s resolve to forego fried food. Deep fried chips chalk up over 250 calories for only 100 grams and chip lovers will rarely have such a modest portion. Oven baked varieties are a better choice. They are simply made at home by chipping four large potatoes (enough for six servings) and tossing them in a bowl with 1 tbsp vegetable oil, half a teaspoon of paprika and half a teaspoon of chilli powder. Spread them on a baking tray and bake in a preheated oven at Gas mark 7 (220 degrees C) for about 30 minutes, turning occasionally. Portions will have around 130 calories. Old-fashioned roast potatoes are worth nearly 160 calories each. For a healthier alternative, roast 2 lbs of halved potatoes for an hour at Gas mark 3 (170 degrees Celsius) after tossing them in 2 tbsp olive oil, 3 crushed garlic cloves, dried rosemary, salt and pepper. This is enough for 8 servings at 125 calories for each portion. Steer clear of pastries if you are hoping to lose weight with your low calorie lifestyle; but, if you must indulge, choose carefully. Pastry is high in fat and sugar. A large individual pastry case filled with raspberries or strawberries might have 440 calories. This is the equivalent to several cups of the fruits by themselves, even with a low fat cream topping! Filo pastry is a lower calorie alternative, baked crisp with fruit and other fillings. A crumpet, at 80 calories, might satisfy a craving for a sweet food if topped with a teaspoon of good jam.